Capital of Cuyahoga county, Ohio, U. S. A.; situated at the mouth of the Cuyahoga River, and an important port on Lake Erie. The history of its Jewish community dates back to the year 1837, when a Bavarian, Simson Thorman, settled here. He was soon followed by others of his countrymen—Cleveland being then a thriving town of about 6,000 inhabitants—and in 1839 the colony had increased sufficiently to warrant the establishment of a permanent religious organization. This first congregation, called The Israelitish Society, began with twenty members. In 1842 it was divided, the seceding branch forming the Anshe Chesed society; but four years later these two again united, and formed the Anshe Chesed congregation, the oldest existing religious organization in the town. 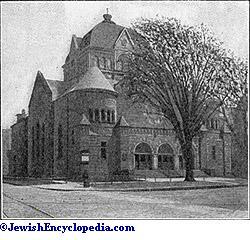 Its first synagogue was built on a lot exchanged for land which had been presented to the Anshe Chesed society, for building purposes, by Leonard Case, a wealthy non-Jewish landowner. Dissensions in 1848 resulted in the withdrawal of members, who in 1850 formed the Tifereth Israel congregation, the second of the now existing congregations. A legacy of $3,000 bequcathed by Judah Touro of New Orleans in 1854, purchased the site upon which its first synagogue was erected. These two congregations have always been the leading factors in Cleveland Jewry—the Anshe Chesed representing the Conservative branch, its present membership being 210; the Tifereth Israel, the Radical Reform, with a membership of 513, and a Sabbath school enrolment of 775. Both are prosperous, and worship in splendid modern edifices. The rabbis of Anshe Chesed congregation have been: Fuld, 1850; E. Hertzman, 1860-61; G. M. Cohen, 1861-66; Nathan, 1866-67; Gustave M. Cohen, 1867-75; M. Tintner, 1875-76; M. Machol, the present incumbent, from 1876. The rabbis of Tifereth Israel congregation have been: Isidor Kalisch, 1850-55; Wolf Fassbinder, 1855-57; Jacob Cohen, 1857-66; G. M. Cohen, 1866-1867; Jacob Mayer, 1867-74; Aaron Hahn, 1874-92; Moses J. Gries, the present incumbent, from 1892. The congregation next in importance is the B'ne Yeshurun Hungarian, which was founded in 1865, reorganized in 1886, and has (1903) a present membership of about 200. Its rabbi is Dr. Sigmund Drechsler. The year 1881 saw the arrival of the first Russian refugees, who, in point of numbers, have since become a highly important part of the community. Besides the three leading congregations mentioned, there are no less than eleven minor congregations, mostly Russian, with a combined membership of about 700—the largest of them, Beth Hamidrash Hagodol Beth Israel, having 600 seat-holders. There are also many so-called "ḥebrahs," formed only for services during the principal holidays. On Oct. 17, 1885, the first American Rabbinical Conference was held in Cleveland. The first annual conference of of the existing Conference of American Rabbis was held in Cleveland, July 13, 1890. The Jewish Orphan Asylum of Cleveland, founded by the Independent Order of B'nai B'rith, District No. 2, was established in 1868; its superintendent since 1878 has been Dr. S. Wolfenstein. This institution, which shelters 500 children, has become famous, being considered a model of its kind (see article thereon in "Ohio State Bulletin of Charities and Corrections," vol. iv. 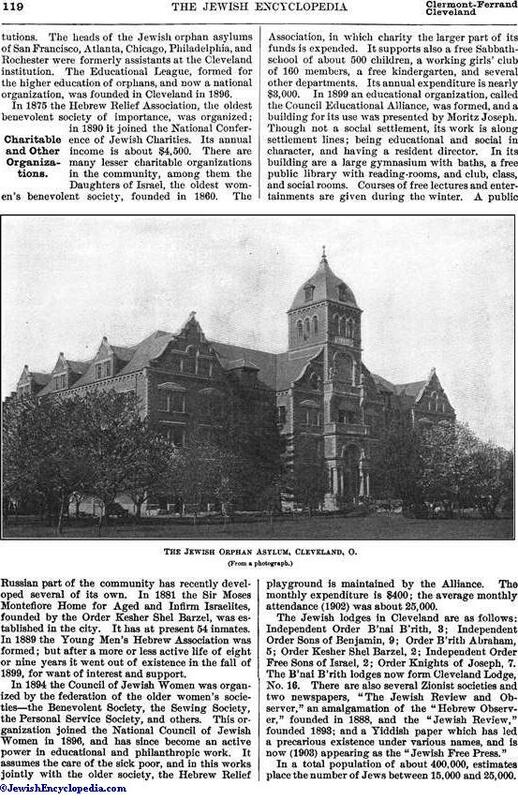 47), and exerting a wide-spread influence in furnishing (from its trained assistants) superintendents and matrons for other similar institutions.The heads of the Jewish orphan asylums of San Francisco, Atlanta, Chicago, Philadelphia, and Rochester were formerly assistants at the Cleveland institution. The Educational League, formed for the higher education of orphans, and now a national organization, was founded in Cleveland in 1896. In 1875 the Hebrew Relief Association, the oldest benevolent society of importance, was organized; in 1890 it joined the National Conference of Jewish Charities. Its annual income is about $4,500. There are many lesser charitable organizations in the community, among them the Daughters of Israel, the oldest women's benevolent society, founded in 1860. The Russian part of the community has recently developed several of its own. In 1881 the Sir Moses Montefiore Home for Aged and Infirm Israelites, founded by the Order Kesher Shel Barzel, was established in the city. It has at present 54 inmates. In 1889 the Young Men's Hebrew Association was formed; but after a more or less active life of eight or nine years it went out of existence in the fall of 1899, for want of interest and support. In 1894 the Council of Jewish Women was organized by the federation of the older women's societies—the Benevolent Society, the Sewing Society, the Personal Service Society, and others. This organization joined the National Council of Jewish Women in 1896, and has since become an active power in educational and philanthropic work. It assumes the care of the sick poor, and in this works jointly with the older society, the Hebrew Relief Association, in which charity the larger part of its funds is expended. It supports also a free Sabbath-school of about 500 children, a working girls' club of 160 members, a free kindergarten, and several other departments. Its annual expenditure is nearly $3,000. In 1899 an educational organization, called the Council Educational Alliance, was formed, and a building for its use was presented by Moritz Joseph. Though not a social settlement, its work is along settlement lines; being educational and social in character, and having a resident director. In its building are a large gymnasium with baths, a free public library with reading-rooms, and club, class, and social rooms. Courses of free lectures and entertainments are given during the winter. A public playground is maintained by the Alliance. The monthly expenditure is $400; the average monthly attendance (1902) was about 25,000. 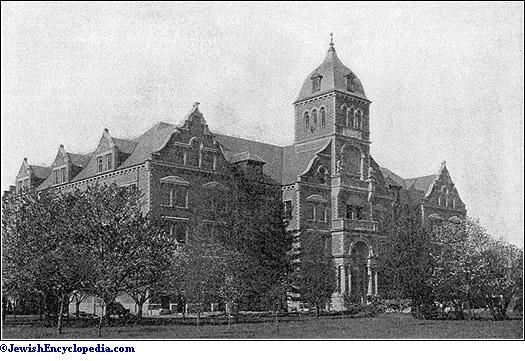 The Jewish Orphan Asylum, Cleveland, O. The Jewish lodges in Cleveland are as follows: Independent Order B'nai B'rith, 3; Independent Order Sons of Benjamin, 9; Order B'rith Abraham, 5; Order Kesher Shel Barzel, 2; Independent Order Free Sons of Israel, 2; Order Knights of Joseph, 7. The B'nai B'rith lodges now form Cleveland Lodge, No. 16. 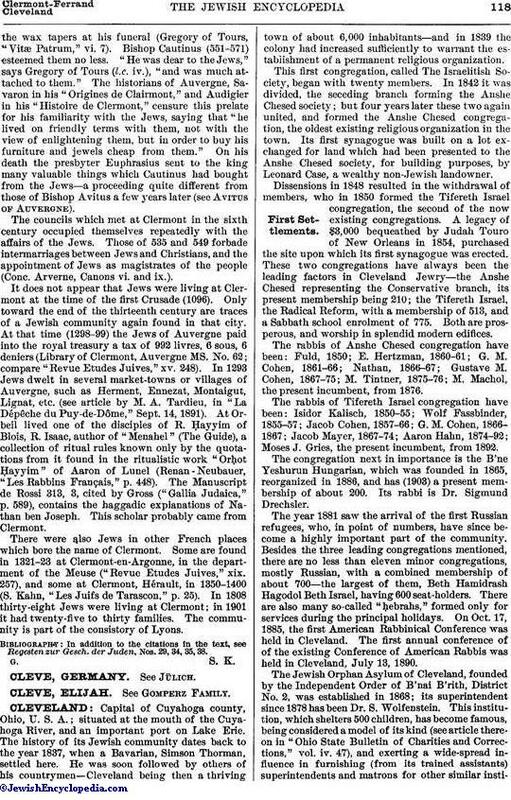 There are also several Zionist societies and two newspapers, "The Jewish Review and Observer," an amalgamation of the "Hebrew Observer," founded in 1888, and the "Jewish Review," founded 1893; and a Yiddish paper which has led a precarious existence under various names, and is now (1903) appearing as the "Jewish Free Press." In a total population of about 400,000, estimates place the number of Jews between 15,000 and 25,000.Of these not more than 7,000 to 9,000 are permanently affiliated with any religious organization. The older part of the community is rapidly increasing in wealth and importance, an extensive cloak and clothing manufacturing interest being almost entirely under its control. Its members are also well represented among the prominent merchants, and in law, medicine, art, and music. The younger part of the community, the Russian and Polish element, is also rapidly forging to the front. Some of its earlier arrivals have already attained to affluence; and they also are well represented in the medical profession. The majority, however, are still small tradesmen and pedlers, with a good percentage of tailors, cloak-makers, cigar-makers, carpenters, shoemakers, plumbers. etc. Temple of Tifereth Israel Congregation, Cleveland, O. 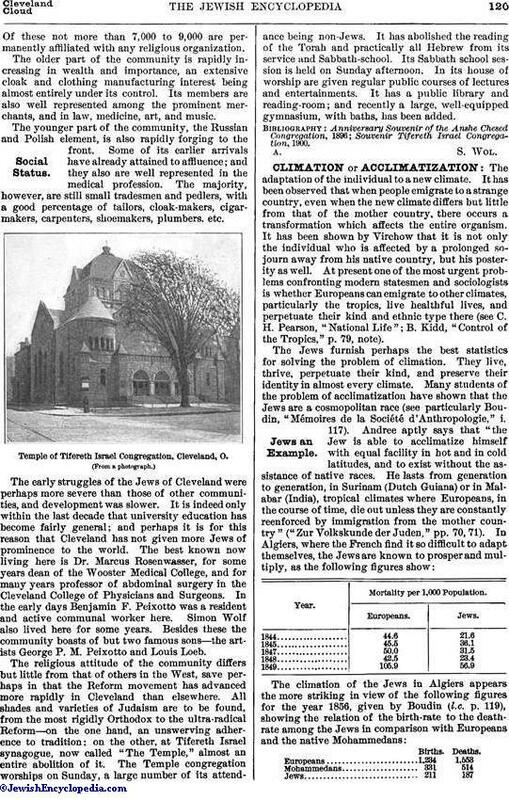 The early struggles of the Jews of Cleveland were perhaps more severe than those of other communities, and development was slower. It is indeed only within the last decade that university education has become fairly general; and perhaps it is for this reason that Cleveland has not given more Jews of prominence to the world. The best known now living here is Dr. Marcus Rosenwasser, for some years dean of the Wooster Medical College, and for many years professor of abdominal surgery in the Cleveland College of Physicians and Surgeons. In the early days Benjamin F. Peixotto was a resident and active communal worker here. Simon Wolf also lived here for some years. Besides these the community boasts of but two famous sons—the artists George P. M. Peixotto and Louis Loeb. The religious attitude of the community differs but little from that of others in the West, save perhaps in that the Reform movement has advanced more rapidly in Cleveland than elsewhere. All shades and varieties of Judaism are to be found, from the most rigidly Orthodox to the ultra-radical Reform—on the one hand, an unswerving adherence to tradition; on the other, at Tifereth Israel synagogue, now called "The Temple," almost an entire abolition of it. The Temple congregation worships on Sunday, a large number of its attendance being non-Jews. It has abolished the reading of the Torah and practically all Hebrew from its service and Sabbath-school. Its Sabbath school session is held on Sunday afternoon. In its house of worship are given regular public courses of lectures and entertainments. It has a public library and reading-room; and recently a large, well-equipped gymnasium, with baths, has been added. Souvenir Tifereth Israel Congregation, 1900.